Were Spiked an American publication, the University of Missouri would surely be climbing those dismal charts, a group of social justice warriors at the school having clubbed together to block and even forcibly remove journalists from an area of the public university. Quick backstory: Earlier this year reports of racist insults being hurled at black students prompted protestors to pressure the university’s president Tim Wolfe to tackle the problem. According to the group, which calls themselves Concerned Student 1950 in reference to the year a black student was first admitted to the University of Missouri, Wolfe did not respond satisfactorily. Cue calls for his resignation, a strike from the college’s football team, and a hunger-strike by one pupil as students started camping on a campus green. Over six rather painful minutes one of the reporters Tim Tai, who is trying to take photographs of the scene, is gradually pushed back by a wall of students, all the while invoking his first amendment rights to report on what is going on. Humanity, of course, is a matter of debate – which is one of the reasons we have laws. Other protestors muttered things about “respectful” journalists, though no journalist is obliged to respect anybody they cover. But the anti-law girl’s response is somewhat milder than the censor who appears at the end of the clip. 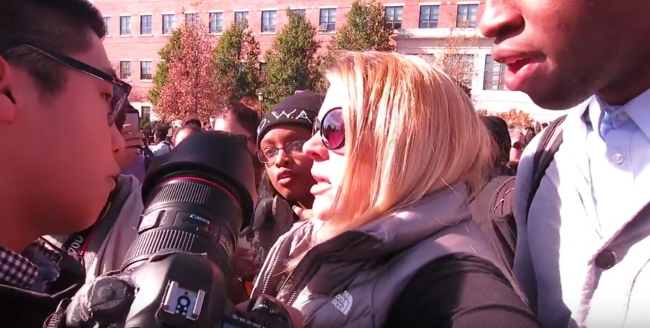 Various media reports identify her as Melissa Click, a professor of mass communications at the school, with the woman attempting to interfere with the camera of Schierbecker and calling for “muscle” when she cannot deal with him. This is what the regressive left has done to campus life. Concerned Student 1950 are not the first people to complain that the press fails to publicise their point of view on their terms. Governments, companies and citizens never desist in whining about slights real and imagined perpetrated by surly, ignorant or “biased” hacks. In American parlance such people are sometimes attacked as extreme liberals. But the problem is that their liberalism is not extreme enough. A genuine liberal would not stop somebody from taking photographs in a public place, even if they dislike coverage from that reporter’s newspaper. As the photographer in the video attempts to explain, the right to protest and the right to report are bound together, just as the right to read freely is linked to the right to speak freely. Click, as an alleged journalism professor, should be fired. But universities need to find some backbone when their students turn out to be cretinous progressives bent on banning anything they dislike. That way the Stepford Students might once again be an amusing curiosity, as opposed to the platitude they are swiftly becoming.